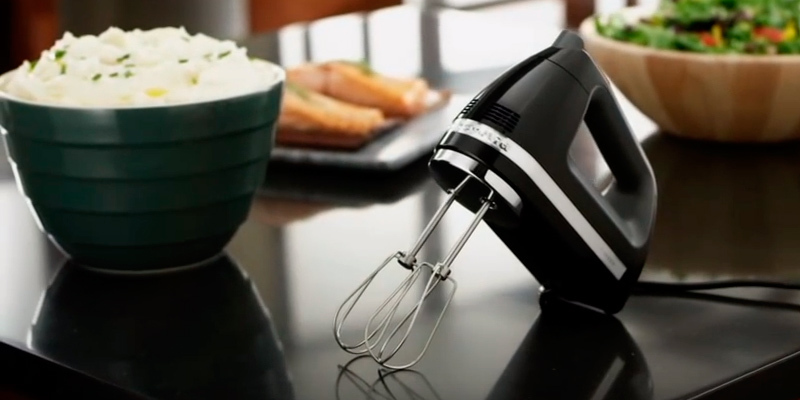 This handheld mixer can mix and whisk up a great range of food ingredients thanks to the powerful motor. Handy cord clips included enable compact storage of the device. The unit operation is a bit noisy. With this top-quality Philips hand mixer, all your desserts will taste and look fantastic, melting in your mouth. 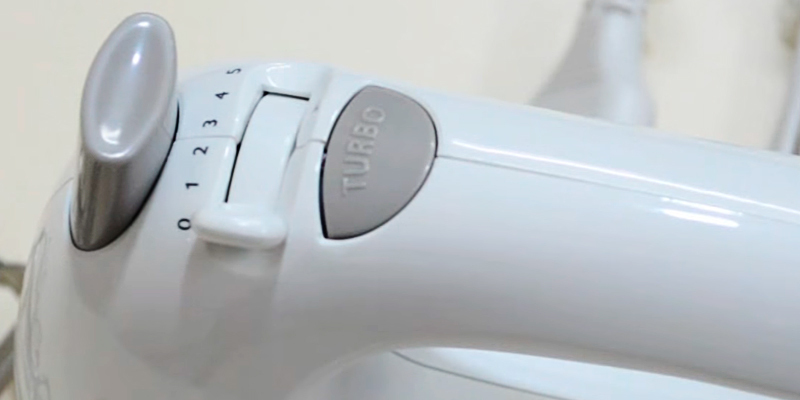 Additional Turbo function enables you to perform tougher mixing tasks. A smooth mat body in black is easy to clean as it isn't prone to stains or fingerprints like glossy surfaces. The unit may overheat under long-term operation. With 3 mixing speeds, this model will become a good choice for doing many basic cooking tasks, like whisking up eggs, beating the batter, mixing cocktails. The black design stands out for its ease of cleaning and looks gorgeous in any kitchen interior. 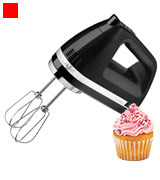 Light weight makes the use of this hand mixer extremely convenient. The release button helps you remove attachments with one movement of hand after mixing is finished. Some users find a power cord a bit short. 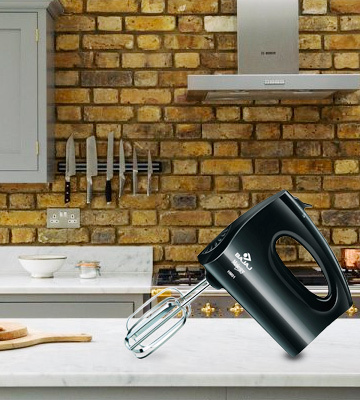 Cooking fast and effortlessly is as easy as anything with the Wondershef mixer at hand. A good option for all those who seek a compact device that would deliver well in terms of comfort, convenience and ease of use. 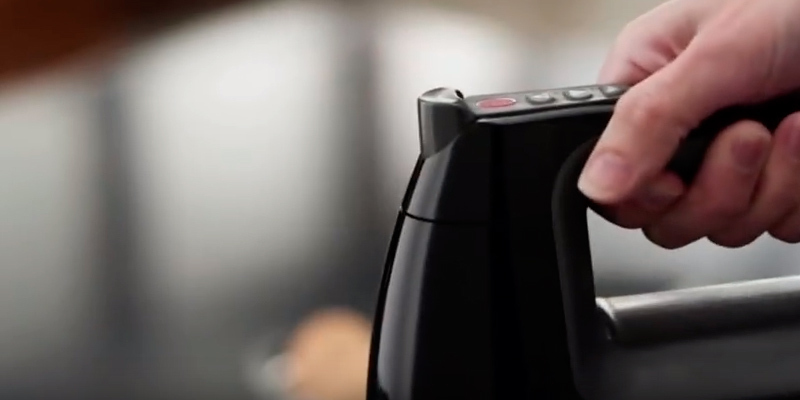 A soft-grip handle makes mixing an effortless process. Thanks to an ergonomic design of the mixer, you won't feel fatigue in your wrist even if you handle a good load of ingredients in one go. Location of the turbo button is somewhat inconvenient. 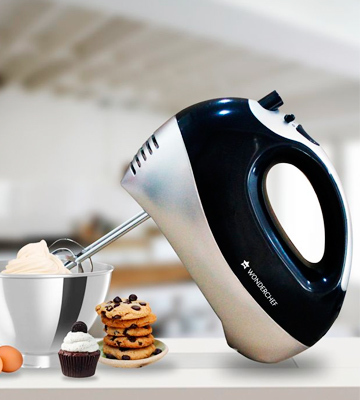 Whether you need to stir egg whites or prepare cookie dough, this model from Morphy Richards will handle the task. 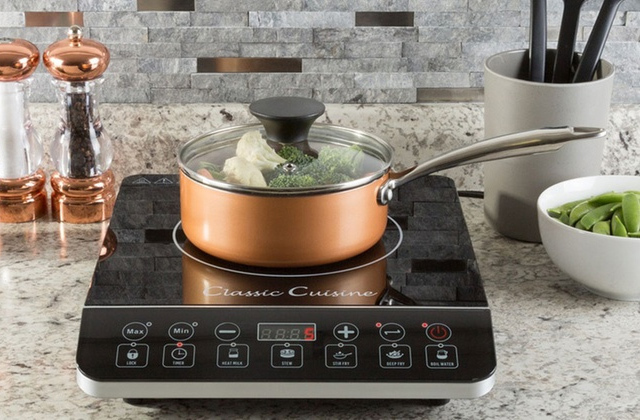 Featuring several speeds and fitted with 2 pairs of attachments, it has everything to facilitate cooking for you. 7 speed settings provide you with the ability to choose the most suitable one depending on what substances you need to mix. A blender rod attachment adds to the functionality of the device. Less powerful than other mixers reviewed. 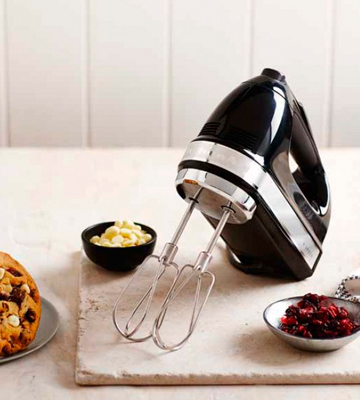 The KitchenAid hand mixer is a great combination of functionality and convenience of use. Ergonomic design, 7 speeds, different attachments, and simple controls will definitely come to your liking. 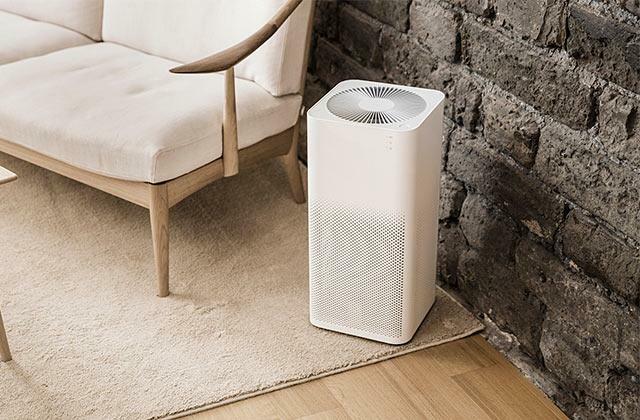 When it comes to Philips, it’s always about top-quality and high-end performance. 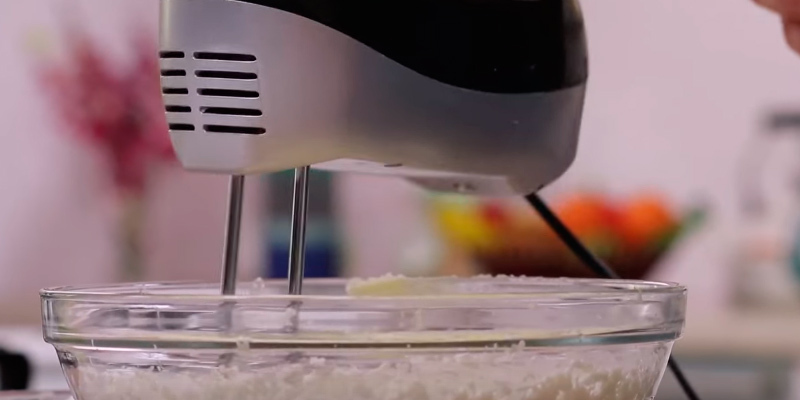 The HR1459 Hand Mixer is not an exception. 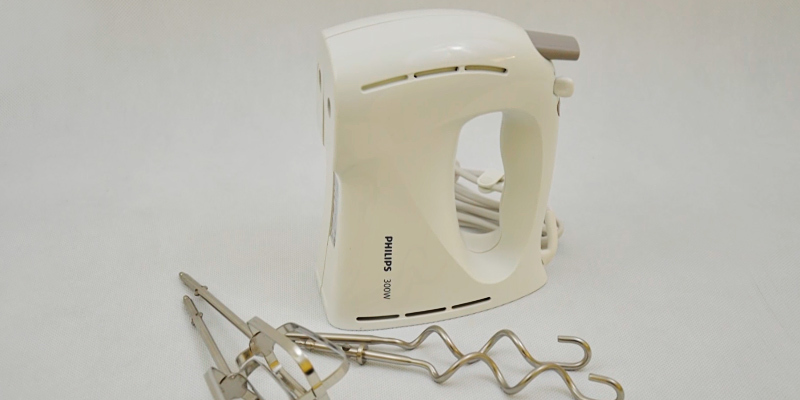 It looks pretty classic and offers all basic functions you may need for daily cooking tasks. It will help you whip fluffy creams, create exquisite desserts, and knead the dough for delicious cakes and flatbreads. An extremely powerful 300-watt motor delivers robust performance and thoroughly incorporates ingredients of any consistency. Meanwhile, 5 speeds give you complete control over the unit and allow preparing both delicate dishes and thicker mixtures. A Turbo function further enhances the mixer performance and will be of great use when you need quicker and more intensive mixing to get the right consistency. 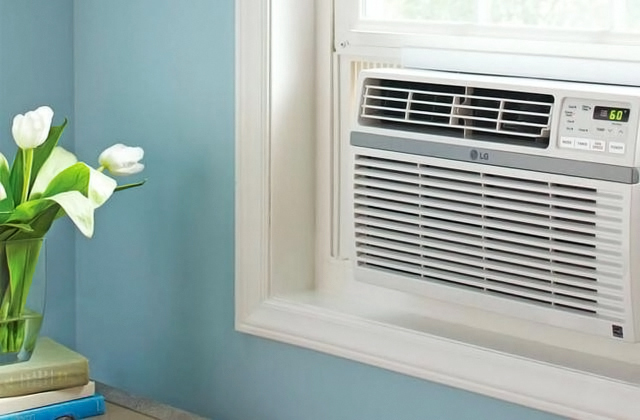 A speed switch is located right on the top of the unit next to the handle for easy one-hand operation. 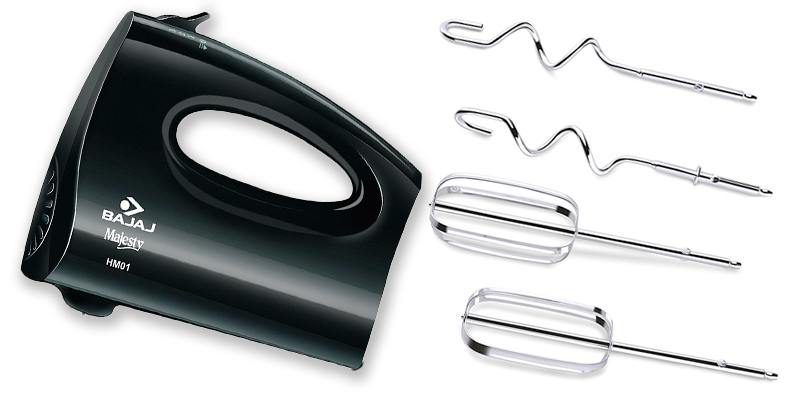 All attachments are made of stainless steel and therefore, suitable both for hand wash and for cleaning in a dishwasher. Keep in mind the mixer itself should not be immersed in water. 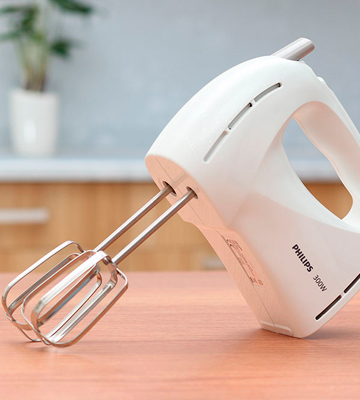 The Philips hand mixer offers standard attachments, including strip beaters and dough hooks. The manufacturer does not recommend using any other accessories except those included in the set. 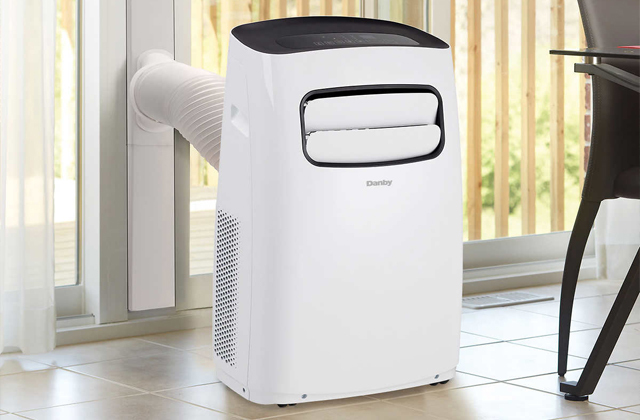 This model is designed for home use only and is not meant for long-term use. Hence, you should avoid doing several mixing jobs in a run to prevent it from overheating. Also, it's highly advisable to follow the manufacturer's instructions on the volume of ingredients allowed for mixing at a time. In case the recommendations are not followed, the maintenance warranty will become invalid. Despite being compact in size this handheld mixer is very powerful and multi-functional. Fitted with special cord clips, it doesn't take up a lot of space at all and easily fits in a small cabinet or a drawer. This simple solution allows you to prevent the cord from tangling and damaging. 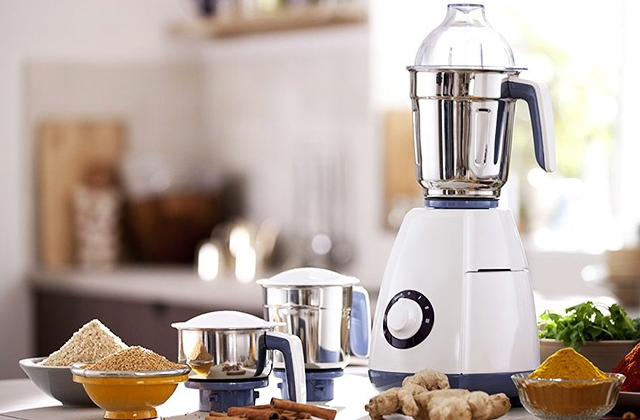 Not only is this mixer convenient to store, it is also very convenient to use due to an ergonomic handle and a flat rear design that allows you to put the mixer right on a worktop between different mixing tasks. If you often cook at home and bake cakes, biscuits, and other baked goods, you may want to add or replace your old bread pan with a new one choosing from the 5 pans we've selected for you. With the Bajaj HM01, you will get a quality and exclusive appliance at an affordable price. The mat back mixer with chromed elements will add stylish and contemporary look to any kitchen interior. Besides attractive design, the Bajaj HM01 can offer decent performance. In the box, along with the mixer itself, you will find two standard attachments: a pair of classic beaters and a pair of dough hooks. 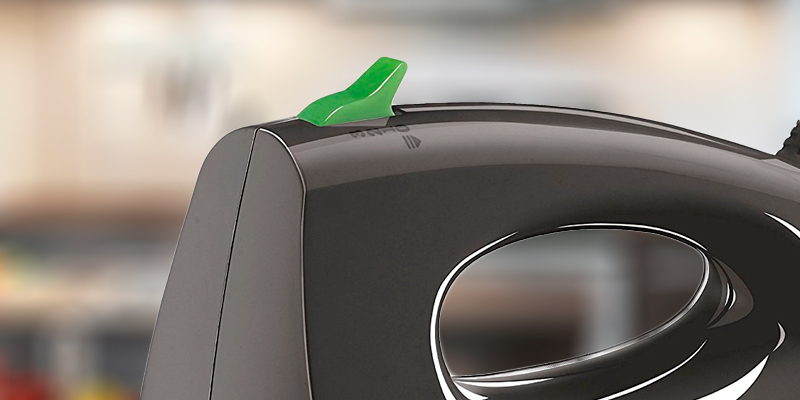 The operating speed of the Bajaj hand mixer is variable and can be adjusted at a touch of a control button. The power yield of this mixer makes 250 watts, which is quite impressive given its small size. So, even though there are only three speed settings, this mixer will still cope with most of the cooking tasks in the shortest time possible. The question how to mix this or that ingredient often arises. However, in most cases, this will totally depend on what ingredients you put in a bowl. Some common recommendations can be given though. Basically, whatever you want to mix, you should start doing it slowly, gradually increasing the speed to the needed one. This way, you'll be able to avoid splatters. The more delicate food you mix, the lower speed will be required. What speed to choose also depends on what you need to cook. Thus, if you whisk up egg with sugar, it's advisable to mix it at a low speed so that the foam would remain soft and aerated. While if you need to whip egg whites for making some cream, the second and the third speeds are preferable. Dairy cream can be mixed both at a low speed if you cook creamy desserts and at a high speed when you make butter or buttercream. The sauces like mayonnaise require a low to medium speed to get the right smooth consistency. Remember that all foods expanding in volume during mixing should be cooled before beating. And if you want to get beautiful steady peaks when whisking use only absolutely dry dishware. 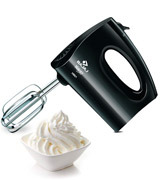 To make a perfect batter or dough, it’s better to opt for a mixer with the power not less than 150 watts. Otherwise, beating and kneading will take much more time and effort. 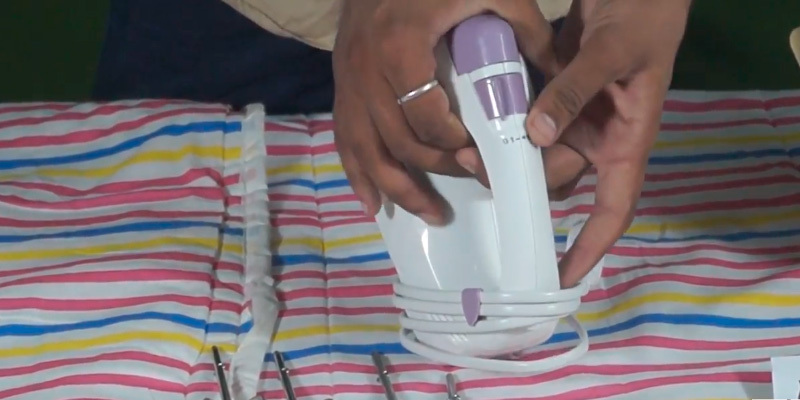 The Bajaj hand mixer with a 250- watt motor is an excellent option for making dough. For cake or crepe batters, you can take the classic beaters, while for dense Chapati or Thepla dough, you will need dough hooks. Notably, to get rid of lumps, it is necessary to knead at a maximum high speed. The high speed also works great for sticky choux paste for Bhature. The hand mixer is especially convenient for making delicate pizza dough. To bake a nice soft pizza without overdrying it, we strongly recommend using a special pizza pan for a conventional oven or a specifically designed pizza oven. In addition, the hand mixer will greatly simplify the process of kneading the yeast-fermented dough. However, to keep its airy porous texture, it is better to finish kneading manually. All unit surfaces are exceptionally smooth including the surface of steel attachments. It gives a sleek attractive look to the device and greatly facilitates its maintenance. You won’t even need any special detergents to wash the unit. Water with some soap for attachments and a clean cloth for the body will suffice. The Wonderchef Prato hand mixer is a powerful kitchen appliance that will turn whipping eggs, whisking up sauces, kneading dough and many other culinary tasks into effortless processes. The power of 300 Watts coupled with as many as 5 speeds makes this appliance a universal model capable of handling just about any mixing task. 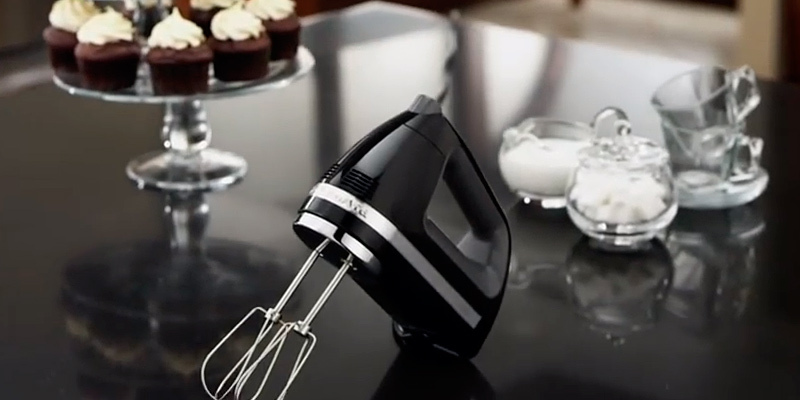 In addition to the power performance, the mixer offers convenience of use. Thanks to the ergonomic mechanical control located right at your fingertips, switching between speeds is easy and quick. Besides the standard speed switch, the mixer has a turbo button which will let you mix hard and tough ingredients taking you no time or effort whatsoever. On the same control panel, you'll find the release button by pressing which you'll be able to eject attachments with one quick movement of hand when mixing is finished. As for attachments, the Wonderchef Prato comes supplied with 2 dough hooks and 2 beaters which should be more than enough for most everyday cooking tasks. Both the hooks and the beaters are made of stainless steel and this means they can be easily cleaned manually or in a dishwasher. With regards to the casing of the mixer, it requires no special cleaning rather than simple wiping with a damp cloth. Finally, we'd like to point out that this mixer, despite such versatile functionality, is very light in weight, which greatly contributes to its usability. Weighing less than 1 kilo, it won't cause fatigue or strain in your wrist regardless of how much food you need to process. It is compact in comparison with a stand appliance and it means that it is easier to use and more convenient to store. Plus, you can also use it as a portable device thanks to its compact size and weight. 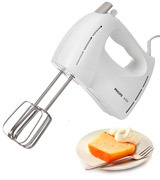 Choosing a hand mixer, you can use more appropriate cookware for mixing necessary ingredients. By this we mean that stand mixers usually come with a large bowl that is impractical to use if you need to make several portions of dessert. 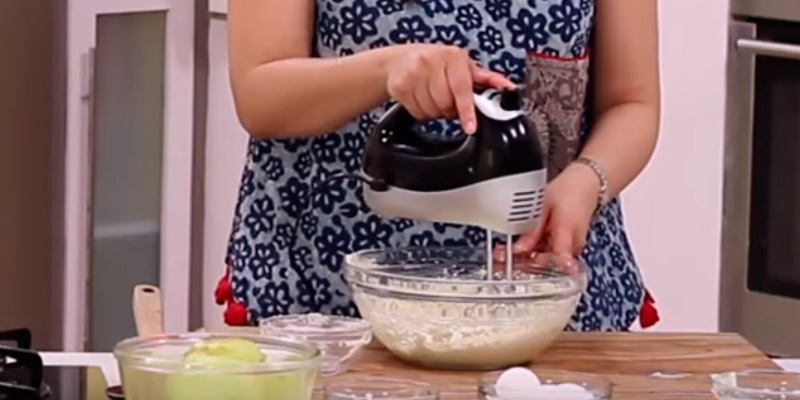 Once you have a look at the Wonderchef Prato hand mixer, you’ll notice how stylish it is. The combination of black and silver colours will come to the liking of different users – those who prefer classic as well as modern designs. In addition to being a nice appliance, it is also easy to use. O-shaped handle provides convenient grip while control buttons located on the handle allow you to switch between the settings with one finger. If you want to make your homemade cakes taste more delicious and look more mouth-watering, the recipe of this simple frosting will come to your liking. All you need to make it is 4 ingredients, your electric hand mixer, and 5 minutes of your free time. Prepare 100 grammes of softened unsalted butter, 100 grammes of softened cream cheese, 2 cups of powdered sugar, and 1 teaspoon of vanilla extract. Mix butter and cheese first, then add powdered sugar gradually. Finally, mix in vanilla extract. Don’t use high-speed settings to avoid spattering. That's it! 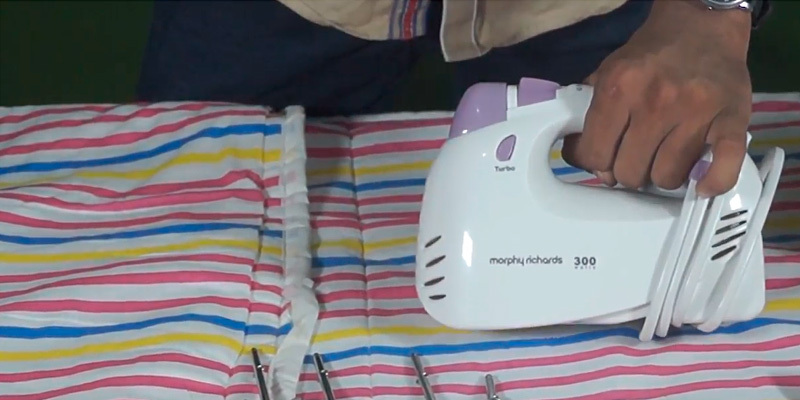 The company's name Morphy Richards stands for high-quality home appliances and happy clients all over the world prove their loyalty to the company for more than 80 years. 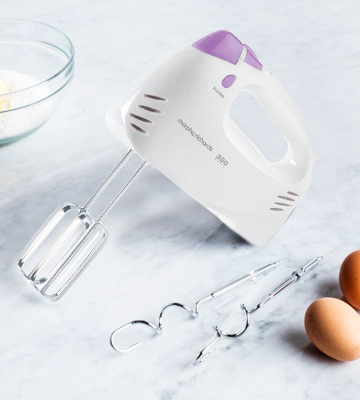 So if you're looking for a mixer that won't fail you for years to come, the Morphy Richards hand mixer is one of the better options to consider. 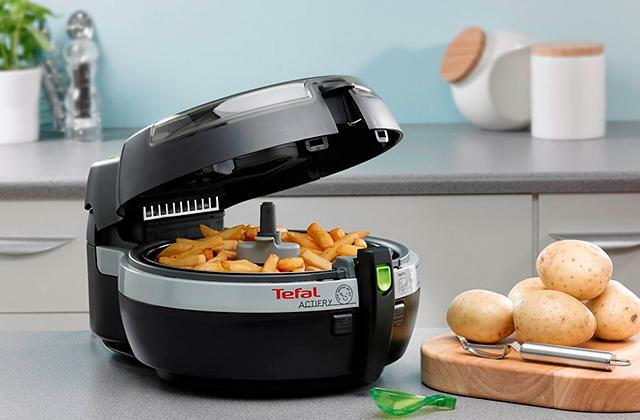 It boasts robust performance thanks to the powerful 300-Watt motor and is able to handle almost any type of food you throw its way. Similar to other hand mixers, the Morphy Richards comes packed with two stainless steel beaters and two kneaders which you can swap depending on the food you mix. For instance, beaters will let you mix egg whites while kneaders will let you mix flour, water, salt, sugar and other ingredients allowing you to achieve a flawless consistency. 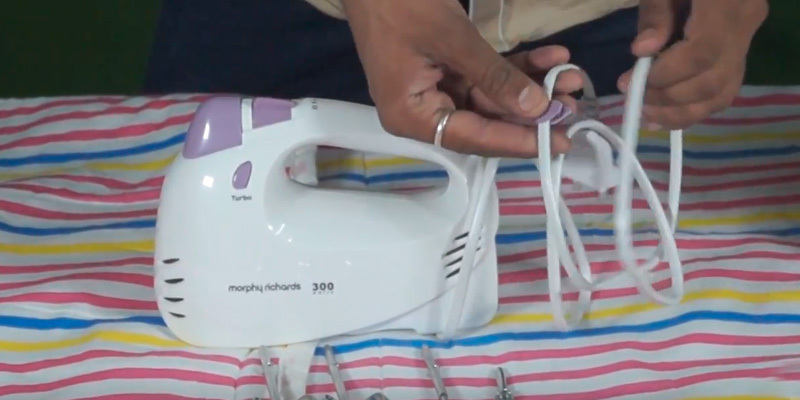 One more thing that adds to the functionality of this Morphy Richards hand mixer is 5 speeds (+ Turbo speed) which you can vary depending on the ingredients you load. Changing speeds is done with a single button which is placed right on the handle for your convenience. 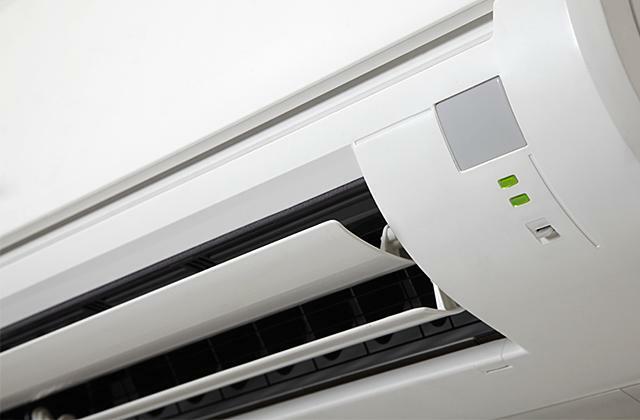 Don’t try to repair your appliance if it malfunctions or doesn’t operate at all, it can invalidate the warranty. If something is wrong with your hand mixer, it is better to take it to an official service centre. 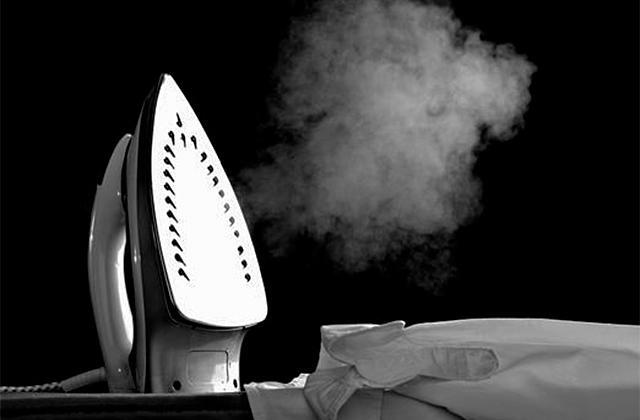 Proper maintenance of an electric appliance is a key to its long service life. 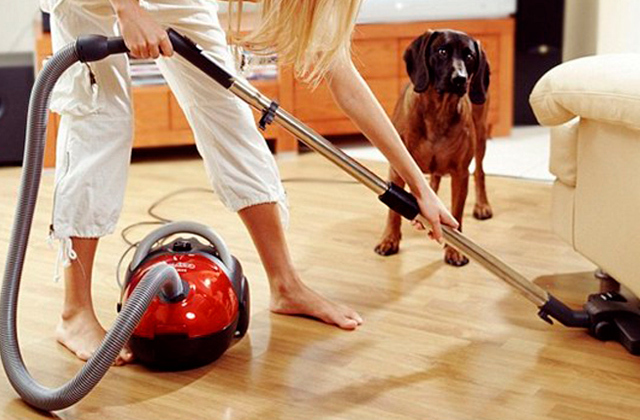 That’s why you want to use, clean, and store your Morphy Richards following some simple rules. 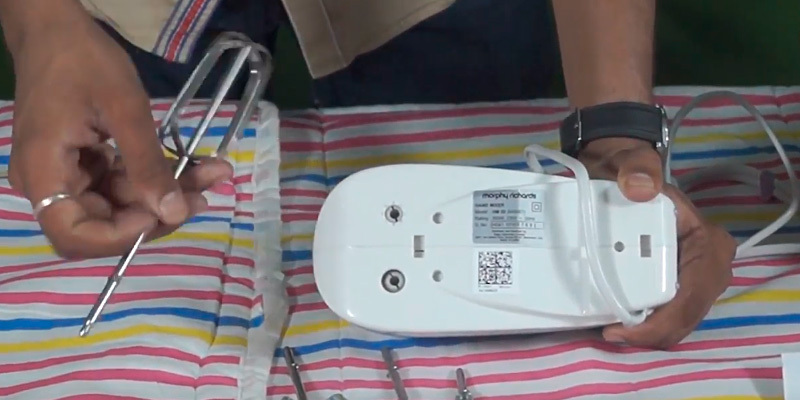 It’s important to operate the appliance only if its cord is in the working condition because if the wires inside are damaged, it can lead to malfunction of the appliance and even electrocution. 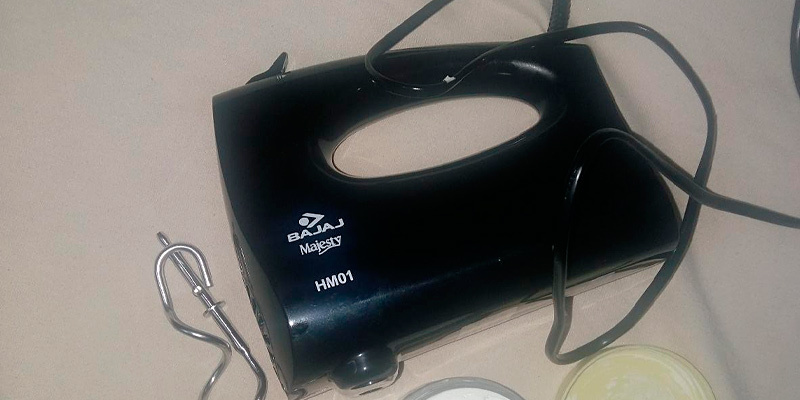 As well as any other model, this hand mixer also needs to be cleaned after every use. Stainless steel attachments can be washed manually or in a dishwasher while the outside of the appliance can be wiped with a soft damp cloth. As for the storage, the main thing you should remember is that it's highly recommended not to wrap the cord around the mixer so as not to bend and damage it. 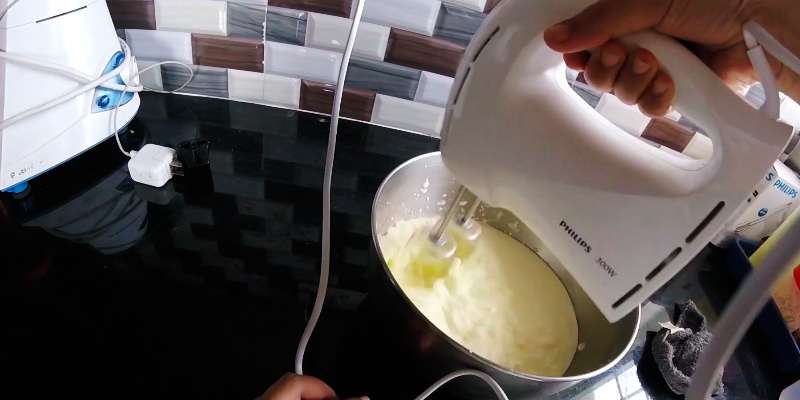 Did you know that you can cook mashed potatoes using your mixer? Once potatoes are boiled, pour away extra liquid so only vegetables are left. Turn your mixer on and choose the third or the fourth speed to mash it. When it is broken into smaller pieces, add some milk. While pouring milk, keep mixing potatoes so that it turns into a smooth substance. By doing so, you'll save yourself the effort of using a regular masher and get a smooth and creamy texture of mash all your family will love. Intuitively understandable control panel with three marked buttons which make it easier to control operation; a small LED display for showing off the chosen settings. An ejector button for quick removal of attachments, which you'll find right on the handle of the mixer. Lockable swivel cord which allows you to set the cord either on the left or on the right so you can use the mixer with enhanced convenience. Soft-grip handle which feels comfortable in the hand and doesn't cause wrist strain or fatigue. Speed 1 is the start of any mixing action whatever ingredients you need to handle. 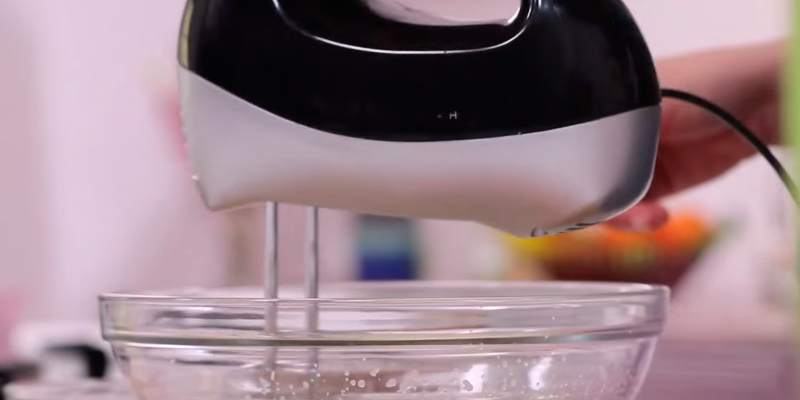 If you’re going to stir liquids, using this speed will prevent splattering. This very setting is also good for mixing dry substances. Speed 2 is best suitable for mixing batter for pancakes. Speed 3 will help you make cookie dough, gelatin mixtures, and light cream cheese spreads. Operating your appliance at speed 4, you’ll be able to make mashed potatoes. Speed 5 is great for making bread dough. Speed 6 allows you to prepare heavy creams. Speed 7 will help you beat egg whites and meringue effortlessly. One attachment that differs this mixer from the majority of its hand-held rivals is a blender rod. If you’ve never used such an attachment before, you might be surprised to find out how helpful it actually is. Using this rod, you’ll be able to prepare smoothies, milkshakes, and other drink mixes. It will also enable you to achieve a perfect consistency of soups and sauces that need to be blended lightly. The size of the rod makes it suitable for mixing from 240 to 950 ml of liquid. Like with any electrical appliance, you aren't totally protected from the mixer malfunction. Which is why you should be ready to diagnose the problem right. One of the common reasons why mixers often do not work once a speed button is triggered is that people forget to plug them in. Funny, but it's true. Check the connection and hit the speed button again. If the mixer still doesn't work, maybe there's a problem with electricity in the house. If not, then you shouldn't try using it again until you show it to a service centre. The problem might be more serious than you think and anything you do to the mixer may cause more bad than good. A hand mixer is a small kitchen gadget used to quickly mix wet and dry ingredients into a smooth homogeneous substance. With a handheld mixer, it won't take you a lot of effort to blend a variety of foods. The device will do all the job for you, sparing you this trouble. 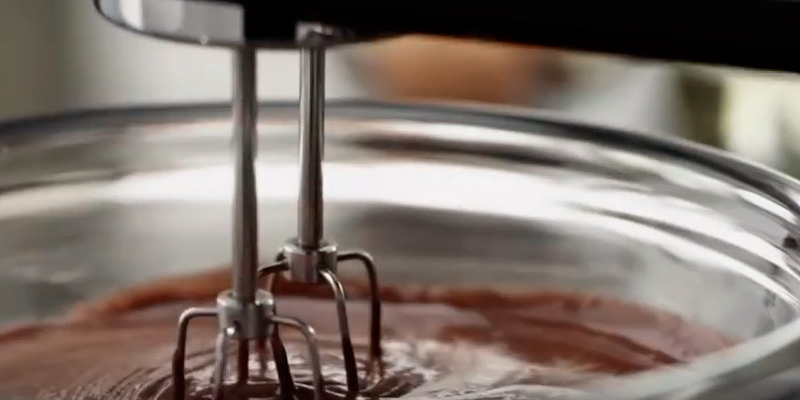 Most modern handheld mixers come packed with additional attachments that enable performing much more tasks than just whisking eggs and creams. They are all made of stainless steel, hence rust-resistant and dishwasher safe. Read further to find out more about advantages of handheld mixers and choose the best hand mixer that will meet your cooking needs. Should you need a more multi-purpose appliance that would not only mix food but also chop, cut, and beat it, pay attention to the handheld and countertop blenders reviews. 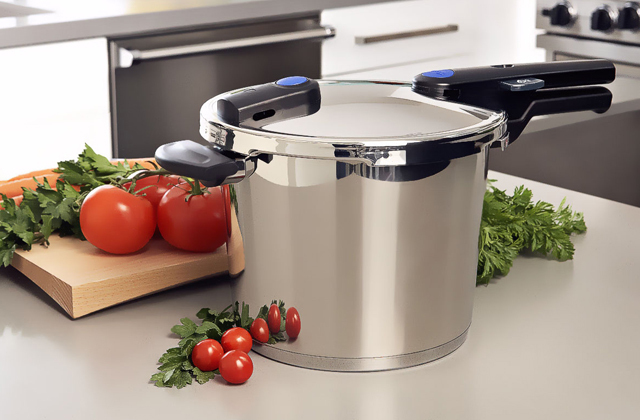 Meanwhile, if you seek a versatile appliance, you may get interested in reading about food processors. The power of the mixer determines its performance. The higher it is, the quicker the mixer will mix food. It's better to decide right away what tasks you will need your hand mixer for. If you don't think you will need to mix the batter and tough vegetables or fruit a lot, 100-150 W mixers will suit you. However, if plan to use it quite intensively and for a great variety of ingredients, it's better to opt for 200-250 W mixers or more powerful. Check out what attachments are included in the package, since the more there are the more cooking tasks you'll be able to perform. All attachments are made of stainless steel to be durable and heavy-duty. 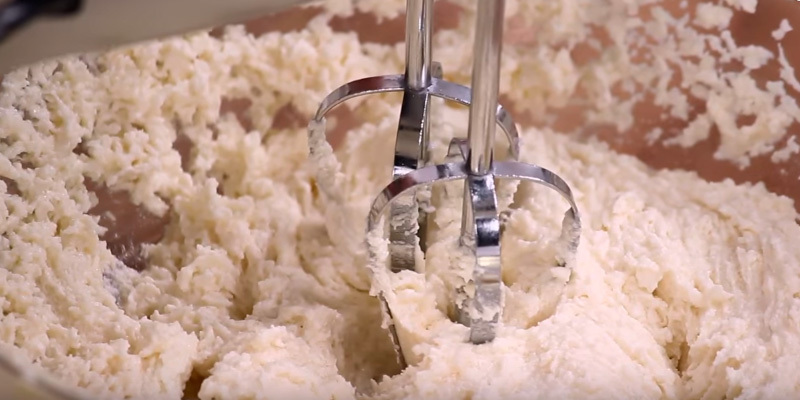 The majority of hand mixers work at 3-5 speeds. However, you can find models that can operate at 7-12 speeds. The more speeds the more ingredients and with less effort you will be able to mix. What we'd also recommend you to pay attention to is whether the chosen appliance has a "Pulse button". With it, it's possible to gradually change the speed and achieve much better consistency of different mixtures. The slow-start function proves useful especially when mixing liquids. If you want to keep your kitchen countertop clean, make sure to check this out. Most hand mixers are made of plastic and fitted with some metal elements or inserts. They also come in different sizes, allowing you to pick the best suitable one for your kitchen. Although, most of them don't require a lot of space anyway. 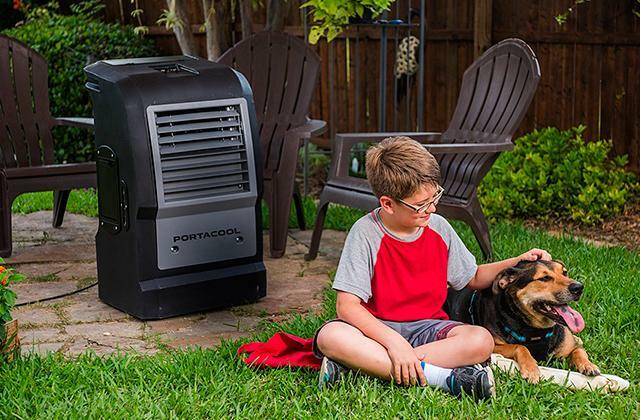 Some models may also offer you a convenient storage of a swivel cord right inside the unit. Q: Do I really need a hand mixer? A: Whether you are a keen baker or just start out, it will be great to have some help with the hard graft of mixing cake batters, doughs, and pastries. This is where a hand mixer will come in handy. 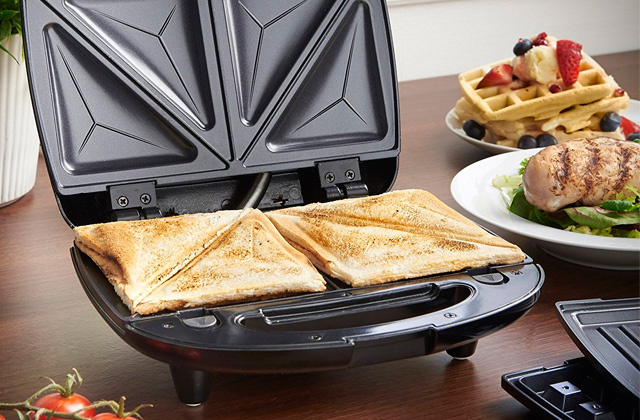 It’s an affordable, compact, and functional appliance that will suit any kitchen space and facilitate numerous kitchen tasks, from baking cakes to blending a simple omelette mix. Q: Should I buy a stand mixer or a hand mixer? What is the difference? A: The choice between a stand mixer and a hand mixer largely depends on what you like to bake, the size of your kitchen, and how much money you're willing to spend. Stand mixers are usually more expensive but for the price, they offer greater functionality and truly unmatched versatility. Thanks to a stand-up design, they will actually do all the job for you. You only need to add ingredients and choose the right attachment. These units can accommodate a variety of attachments and double up as food processors, blenders, and more. Yet, they are rather bulky and will require some space on your countertop. A stand mixer is your best bet if you are a keen baker or need a multi-tasking appliance. Meanwhile, a hand mixer is a better option if you only bake occasionally, whisk eggs or whip cream from time to time, or if you are short of kitchen space and look for a space-wise appliance. Compact yet rather powerful, a hand mixer will speedily manage lighter jobs and is perfect when you need to mix small volumes of food. Q: What are the most important features of a hand mixer? Watt rating for efficient mixing. Q: What ingredients can I mix with a hand mixer? A: Since hand mixers are initially designed for beating dough and pastry they can easily cope with any of the ingredients. They work great with soft and liquid mixtures, but will not affect solids. Q: What are the best speeds for different ingredients? A: Lower speeds are usually used for lighter mixes, such as batter, cream or pastry ingredients. 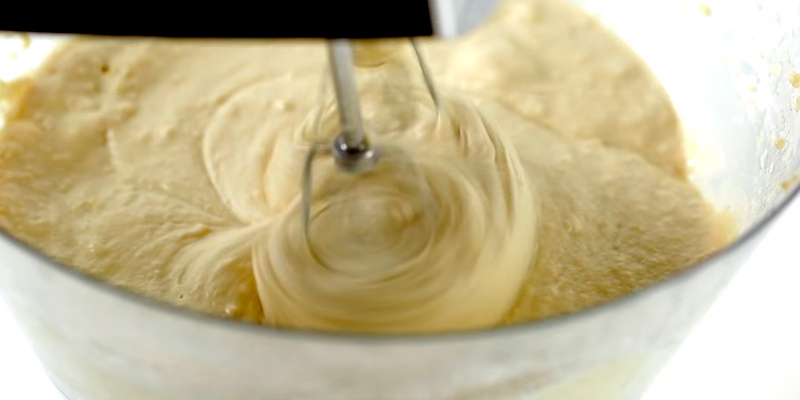 The higher speeds tend to be used for thinner mixtures such as whisked sponge or egg whites, and thick doughs. But remember to increase the speed gradually, rather than suddenly setting your hand mixer to high. 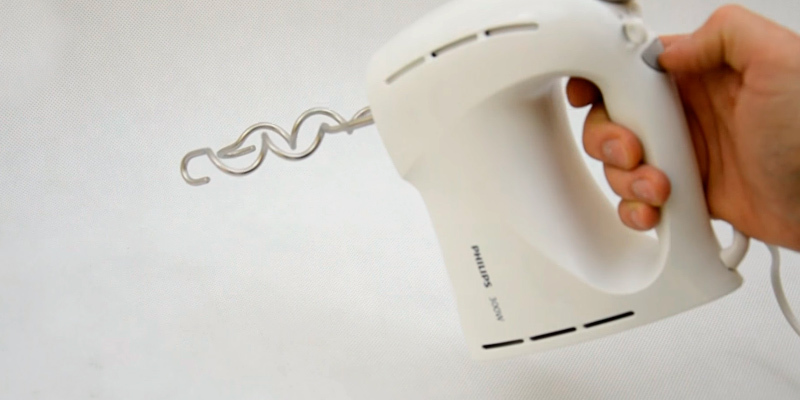 Q: What recipes can I cook with a hand mixer? 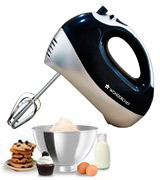 A: Hand mixers specialise in making the dough and batter mixes for countless types of pastries as wells as light and fluffy creams, and liquid or soft mixes for numerous desserts. However, you can also use it for blending a variety of sauces, shakes, and even cocktails. 1. Mixer Buying Guide, The Good Guys. 2. Jane Darling How to Buy the Best Hand Mixer, Which? 3. Jessica Harlan Mixer Buying Guide, About. August 1, 2015. 4. Hand Mixer, Recipe Tips. 5. 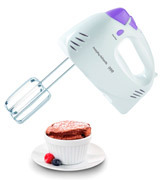 Rebecca Ciaramidaro Hand Mixer Buying Guide, Choice. June 29, 2016. 6. Sam Loveridge Best Hand Blenders, Trusted Reviews. November 21, 2014. 7. How to Choose the Best Kitchen Mixer [Buyer’s Guide], Compact Appliance. 8. How to Buy a Kitchen Mixer, wikiHow.